I had almost forgotten the feeling of perpetually gasping for breath that watching an episode of Unbreakable Kimmy Schmidt induces. With its endless, zippy jokes, the show barely allows room for breathing between laughs. It has some of the best straight-up joke writing on television, up there with Veep in sheer joke density. Seconds into the season three premiere, I remembered just how downright hilarious this show is when Titus Andromedon picks a fight with a “sea pigeon.” Kimmy Schmidt’s wild and weird world is back and ready to delight. Season two saw the main characters through major self-discovery breakthroughs, with Kimmy reuniting with her mother, Titus leaving his comfortable life and relationship to pursue his dreams as a paid performer, and Lillian taking her love for her neighborhood to the next level by deciding to run for office. Season three picks up with Kimmy graduating from her GED program and deciding to go to college, Lillian breaking off things with her boyfriend (Fred Armisen as “Bobby” Durst) in the name of the campaign, and Titus abandoning his life on the sea, feeling like a failure. Their three storylines intersect and build on past character development. Both Titus and Kimmy experience a regression of sorts. Titus is back to his old hangups about money and failure, avoiding Mikey because he’s ashamed. He goes after a job at Sesame Street that takes a very disturbing turn (this show does dark humor in such a goofy tone that it makes it even more unnerving without downplaying the darkness), which helps him re-realize his priorities. It isn’t all too different from lessons he has learned before, but sharp writing and an airtight performance from Tituss Burgess keeps it fresh. When he rushes to Mikey only to learn that he’s seeing someone new, it’s genuinely heartbreaking. Unbreakable Kimmy Schmidt fires off jokes with such speed and confidence that it’s fun to watch no matter what. But the fact that those jokes are fired off by dimensional characters backed with strong emotional storytelling makes it even better. Like Titus, Kimmy moves backwards in her journey when Jacqueline convinces her to withhold from the reverend by not signing the divorce papers right away. Kimmy’s drawn to the sense of control. When the reverend kidnapped her, he forced Kimmy to stop growing up, to stop learning about the world and how to exist in it. Ever since, she has been grasping for control over her life, and she jumps at the opportunity to manipulate the reverend. Every time he calls to see if she has signed the divorce papers, she brags about her everyday freedoms, taunting him. And there’s nothing he can do about it: This time, he’s the prisoner. In an episode full of funny performances (including James Monroe Iglehart’s return as Titus’ nemesis Coriolanus Burt), Jon Hamm stands out above the rest. His delivery elevates the already hilarious writing. This isn’t always the case for every episode, but in this season three premiere, the writers never go for the easy, most obvious jokes. The reverend is characterized as totally fucked up in very effective but unexpected ways, like the fact that he says “clamayto, clamahto” instead of “tomayto, tomahto.” His reference to tomato-clam juice shouldn’t be so disturbing, and yet it is. For so long, the reverend manipulated reality for the girls’ in the bunker. He’s a master of deception and gaslighting, and the fact that he flubs a commonly used phrase feels like an extension of that. Jacqueline also reached a critical turning point by the end of last season when she stood up to her boyfriend Russ’ family’s racism. Russ is out of town for the premiere, so we don’t really get to see more of that journey. In fact, Jacqueline doesn’t have her own plotline in the premiere, but she’s an important force in Kimmy’s revenge against the reverend, and Amy Sedaris’ Mimi Kanasis joins the fray, mostly just to pop in for a one-liner from time to time, but that’s exactly how she should be used. A subtle part of the show’s success is found in the ways it coherently keeps all of its extremely different main characters connected. Jacqueline’s the right person to teach Kimmy about getting the most out of divorce papers. But Kimmy’s eventual breakthrough comes from an unexpected place. Ending things with Lillian, Bobby Durst tells her he feels like she’s too stuck in the past. Kimmy realizes that by stringing along the reverend, she’s stuck in the past, too. She has turned the tables, but she’s still at the same table, wasting her time and energy by communicating so frequently with her past tormenter. It’s a weirdly deep breakthrough, because Unbreakable Kimmy Schmidt is a weirdly deep show. Its characters are more than just joke machines, and that keeps the story sustainable. 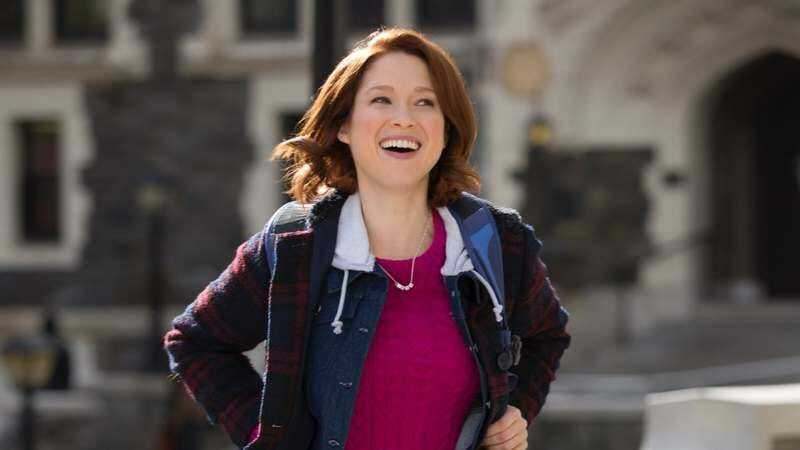 Welcome back to TV Club coverage of Unbreakable Kimmy Schmidt! Life According To Kimmy: Shins should have butts. Life According To Titus: Kids are scary because their teeth are pushed out of their heads by other teeth. Titus drunk-purchased a vanity plate that says DANCE MOM and does not own a car. Armisen’s Robert Durst impression is really just too good. Things that are fake according to the reverend: magnets. Titus thought burpees were baby burps, which he’s very good at. “How’s the pizza in prison?” “Surprisingly authentic!” This is one of the many instances of Hamm’s flawless delivery.